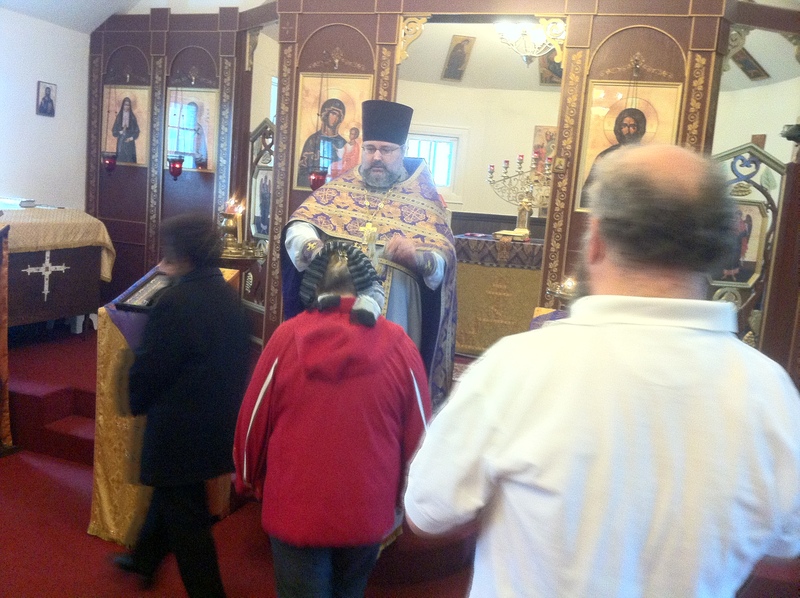 On March 25th, on the 4th Sunday of Lent our parishioners gathered for the Divine Liturgy of St. Basil the Great. The Liturgy was served by priest Igor Tarasov. During his sermon the Rector lectured on Divine Liturgy. Fr. Igor shared some interesting facts about the place of the Nicene Creed in the liturgical celebrations in different ritual traditions. Roman Catholics, Armenians and Syro-Malabara Christians (in India) say the Creed right after the reading of the Gospel. In their rites it belongs to the Liturgy of the Word (our Liturgy of the Catechumens). In our Byzantine ritual which became the Orthodox tradition we include the Creed into the Liturgy of the Faithful. We say it right before the Eucharistic canon, or Anaphora. Fr. Igor also mentioned the symbolic meaning of the removal of the large veil from the gifts and of the waving or shaking the veil above them during the Creed. It symbolizes the stone being removed from the Tomb of Christ and nearness of the Descent of the Holy Spirit. Waving the veil also recalls the earthquake felt in the time of the Resurrection of Christ. After the Creed the clergy serving the Liturgy (the deacon and the priest) have a dialogue with the faithful called the Eucharistic Dialogue. It includes an appeal to the faithful to stand aright for the offering of the holy oblation and a blessing with a wish the congregation to be blessed by the Holy Trinity. Following the dismissal of the Liturgy Fr. Igor recalled the honored Saint of today’s Sunday, Venerable John Climacus. This holy Father wrote an ascetic book called “The Ladder of Divine Ascent”. It describes a number of steps of the spiritual work and warfare against sins and vices in order to achieve spiritual perfection and ascend to the heavenly glory. Fr. Igor reminded parishioners that we are called for perfection and should read that important book. “it was said that the book of St. John should be read almost the whole life. It is not like a novel that we can read in one week or one month and then totally understand it. The content of the St. John’s book is to be experienced by our own spiritual work against our sins and passions in order to get closer to out Creator,” – said Fr. Igor. 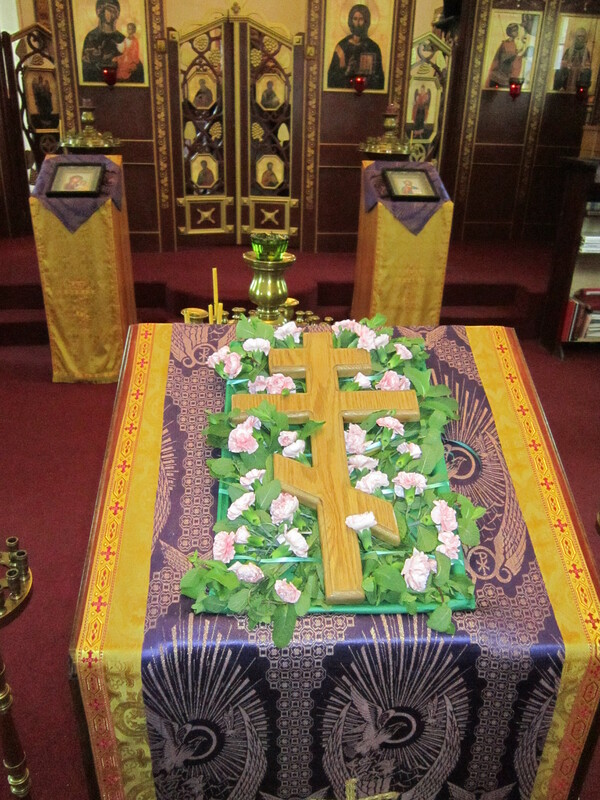 On March 18, on the 3rd Sunday of Lent when we venerate the Holy Cross, priest Igor Tarasov served the Divine Liturgy at St. George’s Church. 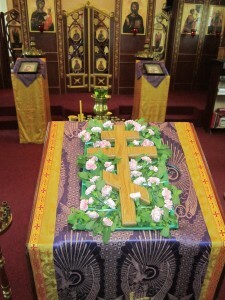 Since there was no Matins served in the temple, the decorated Cross was solemnly transferred from the altar and placed in the middle of the church right before the 3rd Hour. During the sermon Fr. Igor compared today’s Sunday with a stop under a shadow of a tree made by a person on a journey. In the same way on our way of the Lenten pilgrimage we have this Sunday of the Cross as a comfort and refuge in our journey toward holy Pascha. Fr. Igor then continued his lectures on Divine Liturgy. He explained the rite of the kiss of peace, its origins and its practice in our Eastern Orthodox Church, as well as among Western Christians. He further told about the meaning of the exclamation “The doors, the doors, in wisdom let us attend”. The real sense of those words which sound a little strange in our times goes back to the history of the ancient Church when the doors to the place of worship had to be secured. In addition, the catechumens and unbaptized persons were not allowed in the temple during the celebration of the Eucharist. Therefore the deacon signaled the doormen to watch the church doors. Fr. Igor finished his talk discussing the Nicene Creed sung at each Divine Liturgy. Service was ended with the veneration of the Cross. Following the services the parishioners enjoyed coffee and some lenten refreshments. 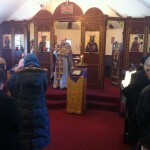 On the 2nd Sunday of Lent priest Igor Tarasov served the Divine Liturgy at St. George’s Church. On this day we commemorate St. Gregory Palamas, a great theologian and teacher of the Church. Our particular, Russian Church also celebrates gathering feast of all Venerable Fathers of the Kiev Caves. Fr. Igor had a homily followed after the reading from the Gospel. He said that on the 2nd Sunday of our Lenten journey we are given an instructive story from the holy Gospel about our Lord Jesus Christ healing a paralytic. But before the healing our Lord forgave the sins of that man. That teaches us about the power granted by God to His Son, and through Him to His Church, to absolve people from their sins. Therefore, we should use the Mystery of Penance, especially during Lent. Penance helps us in our spiritual efforts during such a special time. And the examples of St. Gregory Palamas and of the holy Fathers of the Kiev Caves are also very helpful at this point of our Lenten pilgrimage toward the holy Resurrection. St. Gregory Palamas taught about uncreated light of God, the divine energy that may be obtained through intense prayer and spiritual life, and Venerable Fathers of the Caves did practice spiritual and prayerful life and became the partakers of that light. Fr. Igor then continued his sermon with a lecture on Liturgy. He described the ceremony of the Great Entrance pointing out that the whole Liturgy is an act of universal remembrance. That is why at the Great Entrance we have a commemoration of the Church hierarchy, clergy, civil authorities, founders and benefactors of the temple, and all Orthodox Christians. We ask God to remember them in His Kingdom. Fr. Igor further described the symbolism of the ceremonies at the end of the Great Entrance. When the priest places the Gifts upon the altar, takes off small covers from the vessels and cover them with the veil he recalls taking down of the body of Jesus from the Cross and laying Him in the tomb. This is why the priest, doing so, recites the troparia describing those holy actions. At the end of the Liturgy Fr. 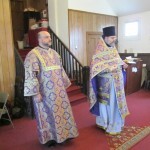 Igor reminded faithful of the celebrations of the Presanctified Liturgy on Fridays. He invited parishioners to attend those services. Such services may comfort the people in their Lenten endeavor. Thanks to them faithful may receive the Eucharist and participate in divine worship not only on Sundays, but on some other days of the week. On the First Sunday of Lent the Church celebrates Triumph of Orthodoxy. On March 4 priest Igor Tarasov served the Divine Liturgy of St. Basil the Great at St. George’s Church. During his sermon he continued to lecture on Divine Liturgy. This time Fr. Igor was telling about the beginning of the Liturgy of the Faithful and about the ceremony called the Great Entrance. It was stressed that the Cherubic Hymn sung at that point of the Liturgy is the heart of the celebration. Faithful represent the Angelic powers in a mystical way and need to lay aside all their earthly cares. For this reason, it is important to be attentive in the church when the Cherubic Hymn is sung. People present in the temple should not unnecessary move, light candles or do other things during that solemn moment. Fr. Igor also explained the symbolism and history of the prayers offered with the hands raised up, as it is done by the priest during the Cherubic Hymn. This pious practice can be found in many religions. For us it originates in the Old Testament, from the prayerful endeavor of Moses who kept his hands elevated praying to God Who gave him revelation from on high. At the end of the Liturgy Fr. 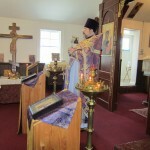 Igor had a short instruction on special lenten services, such as the Liturgy of the Presanctified Gifts. It will be celebrated at St. George’s for the first time in many years. After the Liturgy Fr. Igor and parishioners enjoyed a modest but delicious meal together.